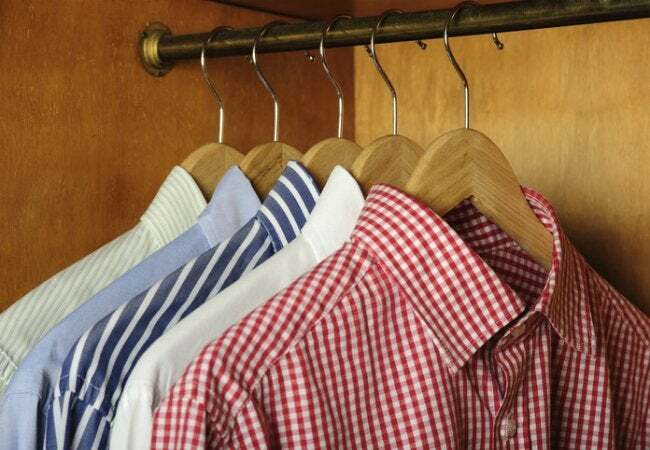 Use this unexpectedly cool appliance hack on your wardrobe for wrinkle-free garments, all without having to haul out an ironing board. This crisp fall forecast calls for bundling up—that means some rummaging through your closet to unearth options for layering under sweaters, like button-up shirts or polos. However, removing the wrinkles from long hibernating heaps of clothing is anything but easy and breezy. You could heat up the iron, but the hands-on process can run long and risk scalding both yourself and your favorite garments. Instead, try an easier method this season. Let off a little steam from your usual domestic duties and undo stubborn wrinkles in your fall wardrobe using only your dryer and some ice cubes from the freezer. It takes just minutes to pull off this clever appliance hack. Start off by loading your dryer with the wrinkled wears. Next, gather a handful of ice cubes (2 to 3 cubes per garment) and toss them into the dryer atop the clothes. Lastly, run the dryer on its highest setting for approximately five minutes. Just as traditional irons combat wrinkles through the application of heat, steam, and weight to clothing, so too do the ice cubes join forces with the hot temperature inside of the dryer to create steam as they melt. This heated environment weakens the molecular bonds of the fabric and helps smooth out any creases. When the timer goes off, empty the dryer to reveal that freshly pressed apparel right on time for that interview or night out.